A touch of elegance and a great way to hydrate your skin, a facial mist can keep your face looking dewy and fresh (and help avoid the cakey makeup look). Facial mists can help you feel and look fab! They’re nice to use on dry skin (think post-plane ride), as part of your makeup routine for a dewy look or simply as a pick-me-up spray. With only a few ingredients including fragrant essential oil, you can have this DIY facial mist for summertime at your fingertips: The distilled water serves as your main ingredient. The glycerine provides the moisture you want, while the lavender essential oil not only provides a nice fragrance (it can help fight stress and help you relax), but it also provides anti-bacterial properties. In the hot months, spritz your face with your mist whenever you feel like it — the essential oil can help soothe and refresh your skin. Play around a bit and try misting your face after you apply your makeup. It can help prevent powder from looking cakey. Some beauty pros suggest you apply a light spritz between each layer of makeup product you use. Before applying the facial mist to your face, first test it on your inner arm, where you skin is more sensitive, to help ensure you can tolerate the ingredients. If you are pregnant, you should not use essential oils. For facts and safety information of essential oils and aromatherapy, check out the National Association for Holistic Aromatherapy. 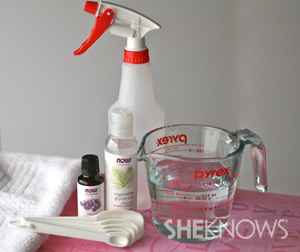 Add the distilled water to your clean spray bottle. Add in the glycerine and lavender essential oil to the bottle. Securely fasten the top to the bottle and shake it to mix the ingredients (shake the bottle a little prior to each use). Hold your spray bottle about six inches from your face to lightly apply it.